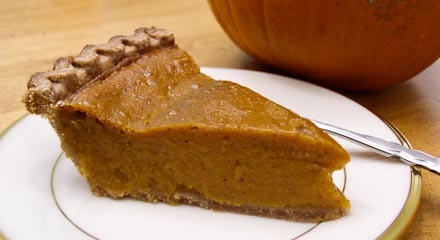 Bryanna’s note: I don’t like pumpkin pie made with tofu-no one ever suspects this one doesn’t have eggs. One caution-MAKE THIS THE DAY BEFORE SERVING. It’s needs a day to set really well, I find. This is a spicy filling. Pour the filling into the pastry and bake 60 minutes, covering the edges with foil if they begin to brown too quickly. Cool on a rack, then refrigerate overnight before serving. I made this pie using full-fat coconut milk and tapioca starch instead of cornstarch. It was delicious. I just popped Bryanna’s pumpkin, now my Pumpkin Upsidedown cake, I added flax to try and help the setting up of it, my family is gluten free. So I added what would be a cake dry mix, I mixed that with a little avocado oil instead of any olive oil, my daughter can’t have, then topped it with almonds. I hope it turns out well. Before my kids became vegan I used to make a Pumpkin Upsidedown Cake. I then made it eggless then gluten free, now I have to make it soy free lol. It sets up as it cools so an hour should be enough unless your oven runs cold. How do you know when its done? The toothpick test? Mine doesn’t come out clean after an hour so I’m wondering if it’s supposed to be a little wet? It looks great! Can’t wait to try. Your receipes are awesome. Thank you so much!! I made a gingersnap cookie crust last night (so not FFV, but it’s a special day!) and I’m making the filling today. Hoping having 2 days in the fridge doesn’t hurt it, but I won’t have time to do it tomorrow. It’s not mushy or runny at all. Take a look at the photo. That’s what it looks like. Who said soy milk? I use almond milk in my pumpkin pie. Coconut or hazelnut milk would also probably be delicious. I’m curious but wary of just using cornstarch as the thickener. I usually use agar-agar, and my pies set up very well. I’m concerned that cornstarch alone would make the pie mushy and runny. How much maple syrup in place of the brown sugar? Thanks Susan!! We will in a little town with no-where to buy a pie crust. Maybe I’ll just leave the pie crust I have uncooked and try it that way. PS I have made SO many goodies from your website, it really is the best!! Tracy, the pie crust will cook along with the pie, and if it’s already baked, it will probably get overdone. Mickshan, tofu and soy milk are totally different and have different textures and flavors. But the main thing for people avoiding soy is that they can use another non-dairy milk in this recipe; it’s harder to find a sub for tofu in recipes that use it. Will try this with coconut milk! I can’t eat soy anymore. Does the pie crust have to be un-cooked? Can it be a previously cooked crust? Does the pie crust have to be un-cooked? I have a recipe for one that needs to be cooked first. And another question: I can’t make pastry well unless you’re planning to make shoes out of it. Are frozen pie shells usually vegan? I’m confused. What’s the difference in a pie made with tofu and one made with soy milk? I used a 9″ whole wheat crust from Whole Foods which was filled to the brim! I followed the recipe except for subbing maple syrup (as suggested) for the sugar and adding BOTH the cloves and allspice. The pie had a strong flavor, but we liked it. And, I love that the recipe is so easy. The only thing disappointment was the pie got a bit goopy on top. I assume that was due to covering it with plastic wrap and putting in the fridge before it was completely cool. It was VERY difficult to get my husband to wait a day to try it! Do you use the frozen or fresh pie crust sold in the dairy dept? Isn’t it loaded with fat? I used an 8- inch deep dish crust but you can also use a 9- inch regular crust. Does this use a deep-dish or regular pie crust? This is the best pumpkin pie. I make this for every major holiday. You can’t even tell it’s vegan. I usually put a half a cup of maple syrup instead of the sugar, because my mother doesn’t eat sugar. This is by far the best pumpkin pie I have ever had! I did make one change as I did not have ginger, so I put in 1-1/4 tsp pumpkin pie spice instead to replace the ginger, nutmeg, and allspice. I am keeping this recipe for future use. Thanks for a wonderful pie!